This article was first published in The Spectator on August 20 2011. The cathedral, built in 1903, was always meant to be covered in mosaic. The bare brickwork of its vast domes and vaults is not part of the design — it was just never finished. But momentum is building to change that. A businessman, John Hughes, wants to pay to get the project off the ground. The first step is deciding who should draw up a design. The cathedral art committee has spent endless meetings discussing which artists might be suitable, and is not yet close to a decision. The person in charge of bringing that design to life, though, will most likely be Tessa Hunkin. I meet her in her tiny central London studio. It is almost like a sweetshop: jars of brightly coloured glass and ceramic fill every shelf. She has spent much of the last decade creating mosaics for chapels, panels and apses at Westminster Cathedral; at one point she had ten employees. Now, though, she is on her own. Hunkin is very fond of the cathedral. Its scale and simplicity, she says, are powerful. 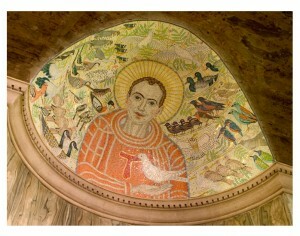 In fact, the challenge of the mosaic design, she suggests, is not to wreck it — not to ‘screw up the space’. A plain design might be better, she says. She started out as an architect but, by her late thirties, she had got bored. ‘I was at quite a low level, and spent a lot of time designing suspended ceilings, access panels and toilets.’ Anything decorative or ‘more interesting’, she says, was palmed off to specialists. A friend, Emma Biggs, was already making mosaics and suggested Hunkin join her. Together, they formed the Mosaic Workshop. Partly, Hunkin says, it’s down to ‘control freakery’. She could design and make a mosaic herself: she has always enjoyed making things. ‘I’ve always thought better with my hands.’ She grew up fascinated by the Arts and Crafts Movement, with its idea that ‘material and technique and design [should] all work seamlessly together’. Mosaic offered her a way to try to do that. At first they ‘absolutely scraped along’, using Biggs’s living room as a studio. The business grew and they moved to a bigger space, but things were always, says Hunkin, quite ‘hand to mouth’. It was varied, though: their customers ranged from Aston Villa football club to a London oyster bar, a magic circle law firm, a Welsh theatre, local councils and churches. The collaborations, Hunkin says, have been a bit like relationships — ‘fraught but rewarding’. She praises one of the painters, Leonard McComb, for his ‘fabulous’ sense of colour. She enthuses, too, about working inside the cathedral. Some of the mosaic had to be fixed on directly, piece by piece. She describes ‘sticking little pieces of gold to the ceiling’ during a sung Mass, and feeling that she was doing ‘exactly the same thing that people were doing thousands of years ago’. It was, she says, very moving. The last cathedral project — a panel of St David — was completed last year, just in time for Pope Benedict XVI’s visit.